County HVAC strives to create safe and healthy indoor environments by providing the most advanced technology, coupled with certified, professional technicians. Dedication to excellence, pledge of service and workmanship, and commitment to innovation is our objective for designing comfortable living. 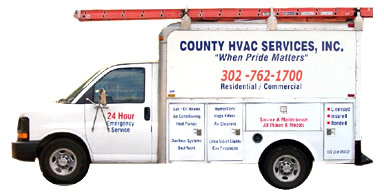 Serving Delaware for over 23 years, the professionals at County HVAC are experts at improving the efficiency of your systems and helping you reduce your utility bills. Whether its upgrading an existing system, replacing portions or simply maintaining your current systems peak performance, well show up, get it right the first time, and follow up to ensure your satisfaction. Emergency service required? No worries! We’re there. All our work is guaranteed. We are Licensed, Bonded and Insured.